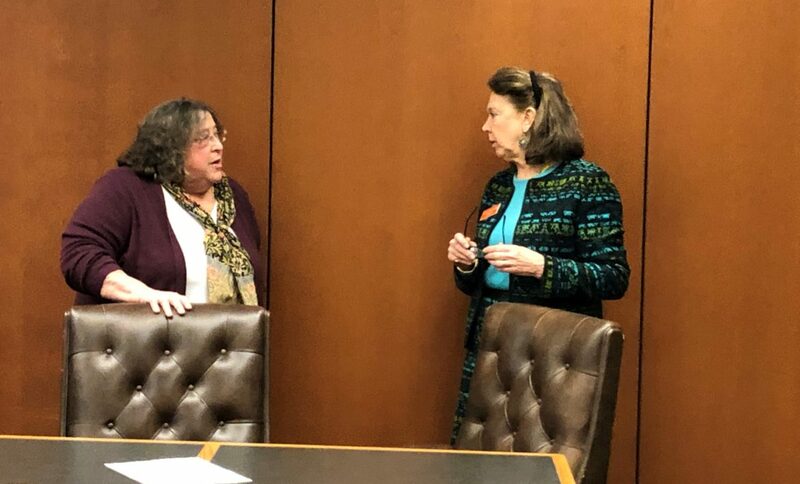 Rep. Marjorie Porter, D-Hillsborough, left, talks with Teresa Rosenberger, the Balsams lobbyist. CONCORD – To reopen the Balsams as a grand resort hotel and create a new outdoor destination in the White Mountains, the legislature must act to create a financing tool to get construction going, developers say. On Tuesday, a subcommittee of the House Municipal and County Government gave cautious support for the measure and agreed to hold off as long as possible to tweak the bill before a vote, which is due by March 13. “I think people are moving slowly and cautiously as they should and everyone has done so much work to see the Balsams succeed and also to protect the county,” Grenier said. The subcommittee learned that commissioners have hired an independent bond counsel who gave them assurances that the county would not be held liable for repayment of a bond because they are not issuing a general obligation bond. The historic, century-old hotel closed in 2011. 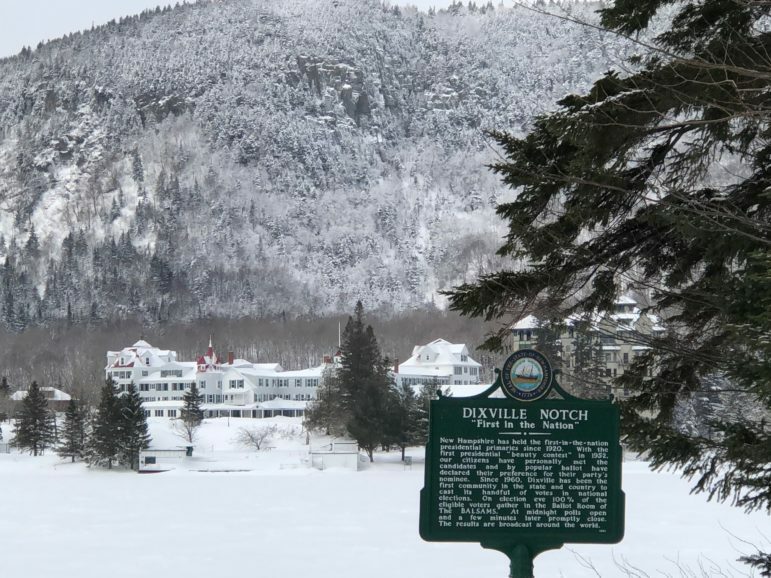 Ski area developer Les Otten, together with other investors, is working on a $173 million redevelopment plan for the resort in Dixville Notch. The first phase would include revitalization of the elegant hotel and create a massive expansion of its Wilderness ski area, making it the largest ski resort in New England. The project would mean 600 construction jobs and 400 full-time jobs. But it would require a $28 million bond. State Rep. Marjorie Porter D-Hillsborough, who chairs the subcommittee, said she has done some research on the project. She was concerned that there could be some financial implications to the county if the project ran into difficulty. Porter said she initially thought they would have to retain the bill for another year, but now feels like it could go forward with the county having hired bond counsel. Porter asked the subcommittee how they felt Tuesday and all six members nodded in support of moving the bill forward. To understand the financials, Otten explained to the subcommittee several weeks ago a financial “four-legged stool” he said that he needs to get the project going. – About $85 million in construction loans. – About $40 million from investors using the new federal Opportunity Zone program for economic development. – About $20 million from Otten and other investors. – A $28 million tax increment finance district or “TIF” bond. The TIF bond can’t be created without the enabling legislation of House Bill 540. If lawmakers pass HB 540, the county commission and delegation would still have to approve the TIF district and it would be up to the developers to find a buyer for the bond without municipal or state government guarantees. The interest rate on this bond is likely to be higher and paying it back is going to be a task, Porter said. “You’ve really got to be careful,” she said noting she has lost sleep over the bill. Economists say a lot has to go right and nothing can go wrong for Otten’s “stool” to work. But they say there is a path forward with this, and the timing with a strong stock market is better now than even a year ago. One of the three Coos County Commissioners is not supporting the bill. Rick Samson said he fears that the measure would somehow leave the county to suffer and it would divert money needed to operate county services, like the nursing home and jail. Rep. Edith Tucker, D-Randolph, who sponsored the bill, said it is “very, very clear,” that there would be no liability to the county and that money would come to the county after the bond is paid off, likely in 20 years. Otten said the project has been vetted and is “viable” and that there are markets out there to explore once the enabling legislation is passed. “Our group, after having spent a significant amount of money, decided we wanted to continue to pursue the project….if there was a way for the county to take it on without the liability,” Otten said. InDepthNH.org is New Hampshire’s only statewide, nonprofit daily news outlet.